At the heart of Damien Chazelle's Whiplash is a deceptively simple question: What does it take to be great? Not very good, not better than most, but truly great. That question is explored through the story of Andrew Neyman (Miles Teller), a 19-year-old drummer who has enrolled at the prestigious Schaffer Conservatory. Andrew believes that he has it in him to become one of the greatest jazz drummers who has ever lived, and that the best way to achieve that is by landing a place on the Schaffer Studio band, under the guidance of its conductor, Terence Fletcher (J.K. Simmons). Once he makes it into the band as an alternate, Andrew discovers that Fletcher is not like other teachers; he employs verbal and physical abuse, mind games and a fascistic approach to discipline to get the most out of his musicians. Faced with such hostility, Andrew tries to rise to the occasion, even if it leaves him exhausted with blood pouring from his hands. Whiplash is best understood as a twisted inversion of an inspirational teacher movie. Chazelle gives the film the warm glow of an accessible crowd pleaser, and assembles the musical performances with razor-sharp editing and dynamic camera movements to suggest that something triumphant is happening, but it's all sleight of hand. "Triumphant" in Whiplash means playing the same fills for hours on end until the sticks and the drums are slick with claret, and the only measurement of success involves meeting the criteria of someone who hates you. It's a bizarro Dead Poets Society in which encouragement and belief is replaced with outright cruelty, and Robin Williams is replaced with R. Lee Ermey. Rather than turn Fletcher into a cartoonish figure of bile and terror, the film goes to great lengths to elucidate the logic behind his brutal approach to teaching, a logic which is tied into a semi-famous anecdote about Charlie Parker. The story goes that as a young saxophonist, Parker got the opportunity to play with Jo Jones, the drummer for Count Basie's Orchestra. The inexperienced Parker made an error, so Jones threw a cymbal at his head. It was a humiliating moment for Parker, but a formative one, one which drove him to become so good that no one would ever have reason to doubt his abilities again. In Fletcher's words, Parker became "Bird" the moment that he was nearly decapitated by a cymbal, and he in turn abuses his students in the hope of finding one who, when pushed, will do something amazing. It's basically Malcolm Gladwell's theory that it takes 10,000 hours of practice to get good at anything, with the added caveat that for at least 9,000 of them you'll be screamed at by a bald sadist. Fittingly, the film displays the same rigour and discipline as its characters. Chazelle wastes no time setting up the symbiotic relationship between Fletcher's destructive pursuit of greatness and Andrew's self-destructive desire to be great. The story fleshes out Andrew's home life a little bit by showing his warm relationship with his failed writer father (Paul Reiser), and a tentative romance with Danielle (Melissa Benoist), a young woman who works at an art house cinema. Each scene achieves what it needs to then ends, which results in one of the most blisteringly fast films I've seen in a long time. However, even these modest embellishments serve mainly to feed into Andrew's psychology. The outright animosity he has for most of his family reflects his desire to be recognized as truly exceptional (and that he already believes that he is most of the way there) while Danielle's main role is to serve as a sacrificial lamb for his overpowering desire to be the best. Benoist gets short shrift - she's only in about four scenes in the entire movie - and she does the best that she can with a character that is barely there, but even that is forgivable because the chilly ease with which Andrew casts her off further underlines his obsession. Nothing matters to him except drumming, and his myopia, indirectly encouraged by Fletcher, consumes him. In depicting that singleminded focus, Miles Teller shows that he a truly magnetic presence, largely because he never makes the mistake of trying to make Andrew likable. He has a certain awkward charm in his scenes with Danielle and he clearly loves his dad, but Andrew is an obsessive, self-absorbed narcissist who honestly and fully believes that he is better than everyone else. If it weren't for the fact that he spends so much of the film beating himself up (literally and figuratively) over failing to meet his mentor/abuser's high standards, he'd be the kind of dickhead who gets his comeuppance in the third act when the real hero shows him up. In real life, Teller is a trained, and clearly talented, drummer, so the scenes of him playing have an authenticity and a vitality that helps sell the sense of exhaustion and pain that overcomes Andrew throughout the film, but the real verisimilitude comes from the moments between beats: The little smiles, the violent frustration, the unwavering need to win. As his sparring partner, J.K. Simmons is simply mesmerising, and he makes a strong case for being considered one of the best American actors currently working. Whether he is hurling florid insults or chairs, he completely dominates the frame and cuts a domineering figure in his all black outfits (a look which reinforces the fascistic way in which he treats his musicians). The title refers to the song of the same name composed by Hank Levy which features prominently throughout, but it could just as easily apply to the speed with which Simmons flips from quietly charming to devastatingly cruel. He's a shark waiting for the moment to strike. His turn as Fletcher is reminiscent of his terrifying work on HBO's Oz, so the role is not completely out of the blue. Yet coming at this point in his career, when his public persona has been shaped by his role as J. Jonah Jameson in Sam Raimi's Spider-Man films and as a cuddly father figure in a slew of indie movies and TV shows, it heightens the contradiction of his work in Whiplash. We're so used to thinking of Simmons as a kindly or buffoonish figure that seeing him be so malicious is genuinely shocking and exhilarating. While expounding on his philosophy to Andrew at a late stage in the film, Fletcher says that "There are no two words in the English language more harmful than 'good job.'" 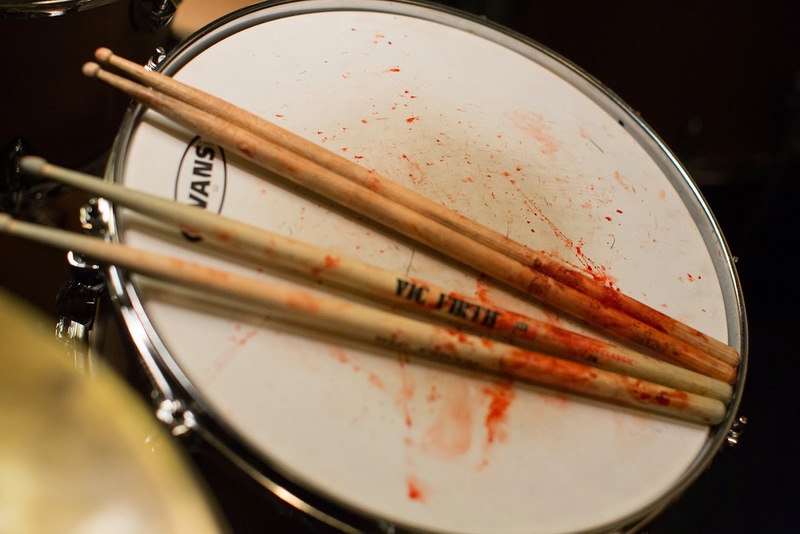 For fear of harming the film or Damien Chazelle's career, I'll say that he could have done better with Whiplash. I'm not sure how exactly he could have done better, but if saying that will help him create something even more amazing next time out, it's definitely worth the risk.